Cryptocurrency email, push notifications, Telegram and discord alert to connected devices dependent on parameters set by users. It comes out of the box with various levels and types of alerts. Get notified on changes on the value of your portfolio. CoinMarkertAlert currently helps over 17,000 customers protect their cryptocurrency investments. 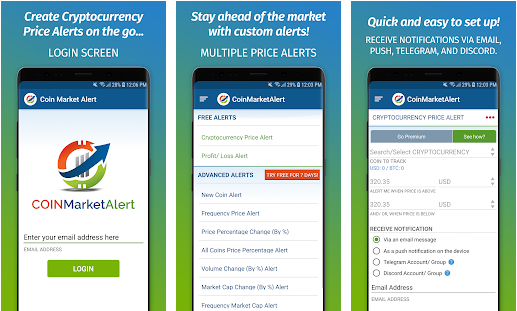 PRICING - Price Alerts and portfolio features are Free to use for first 7 days and then cost a low fee of $2 per month to continue using the alerts and portfolio features. CRYPTOCURRENCY PRICE ALERT - Get notified when your selected coin price goes above or below your selected price. PROFIT/ LOSS ALERT -This alert keeps you informed on if you're making a profit or loss on your selected coin. ALL COINS PRICE PERCENTAGE CHANGE ALERT - This alert notifies you if any tradable coin’s price increase or decrease based on your defined percentage and within your specific time frame. NEW COIN ALERT - This alert keeps you informed on if there is a new coin released in the market. TOTAL CRYPTO MARKET CAP ALERT - This alert notifies you on the Total Cryptocurrency Market Cap based on your defined time frame. FREQUENCY PRICE ALERT - This alert notifies you on the price of a specific coin at your specific time frame. PRICE PERCENTAGE CHANGE (BY %) - This alert keeps you informed on if there is a percentage change in the price of your selected coin. VOLUME CHANGE (BY %) ALERT - This alert keeps you informed on if there is a percentage change in the volume of your selected coin. MARKET CAP CHANGE (BY %) ALERT - This alert notifies you when your selected coin's market cap goes above or below your selected percentage. 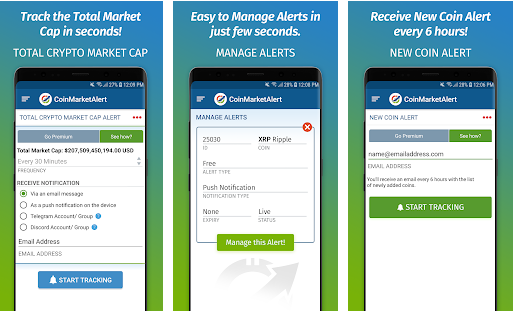 FREQUENCY MARKET CAP ALERT - This alert notifies you on the market cap of a specific coin. CMA Token Rewards - Earn CMA tokens for creating alerts and staking CMA tokens.